Film stock is currently an endangered species, with only a select few filmmakers left with the clout necessary to insist on shooting film versus digital. Both mediums have their pros and cons, but the prospect of film disappearing—because digital is so much cheaper from a studio standpoint—was a worrisome one. 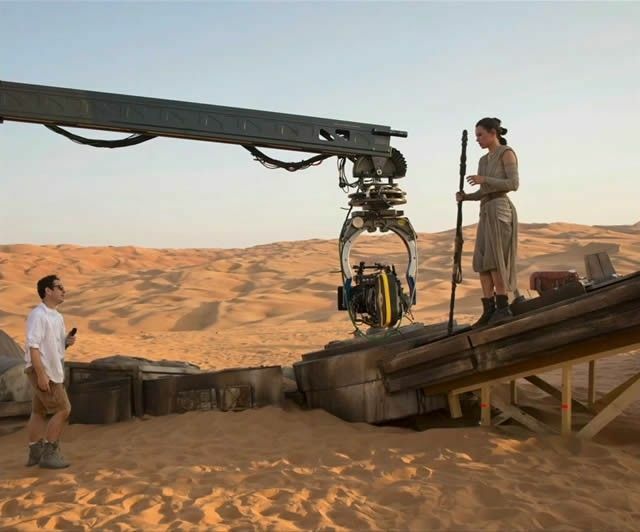 J.J. Abrams is one of the filmmakers leading the charge to keep film alive, and fans rejoiced when he opted to shoot Star Wars: The Force Awakens on 35mm, using IMAX film stock for certain sequences. @LaRabiaCompany I really wanted to, but for some specific logistical reasons we’re sticking with 35. This is encouraging news, and I take it to mean that the new “Episode” installments will maintain consistency by shooting on film stock. If there’s any disappointment from this news, however, it’s that Johnson initially wanted to use 65mm cameras. Quentin Tarantino is planning the largest exhibition of 70mm projection in years with the release of The Hateful Eight this fall, and rumors are swirling that Paul Thomas Anderson is considering going back to 65mm for his next film. When done correctly, in the hands of a master like David Fincher, digital can be beautiful, but more often than not it leads to laziness and cheap-looking images. It’s nice to know that Star Wars—one of the biggest franchises on the planet—will be doing its part to keep film alive.